The oil palm, Elaeis guineensis, originates in tropical Africa and has spread throughout most of the rest of the world, now representing an economically important crop in Southeast Asia, West Africa and Brazil. It has been recognised as a highly nutritious and medicinal compound for thousands of years. Red Palm Oil is a fruit oil, much like Olive Oil and is pressed from the fleshy mesocarp of the reddish palm fruit. It is not to be confused with Palm Kernel Oil from the same plant. In its virgin form, Palm Oil is red to orange in colour with a nutty aroma and is semi-solid at room temperature. Red Palm Oil owes its dark red hue to an abundance of carotenes. In fact, it is the richest dietary source of the provitamin A carotenes, beta-carotene and alpha-carotene, outshining even carrots which have less than 7% of the quantity Red Palm Oil has. Carotenes need fat for conversion to vitamin A which makes Red Palm Oil the perfect transport system for this vital vitamin. 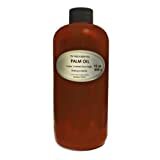 Palm Oil is roughly half saturated, containing palmitic, stearic, lauric and myristic acids and half unsaturated with linoleic and oleic acids. Palmitic acid accounts for 44% of the total fatty acid composition. Besides beta and alpha-carotene, Red Palm Oil also has over a dozen other carotenes, including lycopene, vitamin K, CoQ10, squalene, phytosterols, phospholipids, chlorophylls, flavonoids, phenolic acids, and glycolipids. On top of that, it is also among the richest natural sources of vitamin E, containing ordinary vitamin E in the form of tocopherols and the supercharged variety, tocotrienols, which have 60 times more antioxidant activity. There are four tocotrienols and Red Palm Oil has them all plus a number of other antioxidants, so could be called a super antioxidant. It is resistant to heat and oxidation. Think of Red Palm Oil as a potent, naturally occurring supplement. It has substantially more nutrients than any other edible oil and is beneficial for growth, brain function and a host of other processes. It is good for heart health and cholesterol levels, helping to remove plaque build-up in arteries and to lower elevated blood pressure, protecting the heart from disease. As Red Palm Oil is a powerhouse of antioxidants, it has potent anti-inflammatory capabilities both inside the body and topically. It can reduce the symptoms of metabolic syndrome and diabetes and protect against asthma, arthritis, osteoporosis and a number of other diseases. 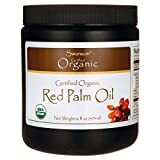 The tocotrienols in Red Palm Oil are specifically beneficial to the brain, liver, skin and immune system and can inhibit the growth of skin, stomach, pancreas, liver, lung, colon, prostate and breast cancers, targeting multiple cell signalling pathways. Red Palm Oil is moisturising, nourishing and protective for hair and skin and useful for scar and wrinkle reduction. It is used in creams, soaps, shampoo and conditioners. As a supplement, it is used to correct vitamin A deficiency. Red Palm Oil is a very versatile and healthful cooking oil with a neutral flavour and high smoke point that is shelf stable and suitable for frying and baking. Wash the rice several times until the rinse water is clear. Add the rice, garlic, pepper, salt and Red Palm Oil. Mix well. Let simmer for 25 minutes. Serve hot.